A multi-functional equine teether and 3 in 1 stable toy that you can hang from the wall, leave on the floor or attach to the stable door. 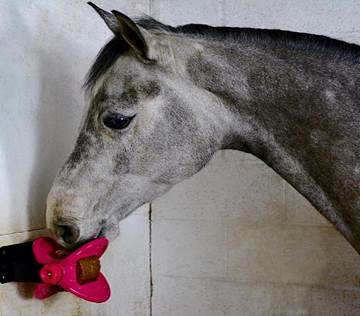 A multi-functional equine teether and 3 in 1 stable toy that you can hang from the wall, leave on the floor or attach to the stable door. Shown to be highly effective in reducing stable vices and boredom, or can simply be used for fun. Features sponges made from biodegradable fibres which are soaked in mint essential oil and inserted inside the toy to give off a lasting mint scent. Developed to extend the horses interest long after the edible refill has finished, this is an innovative interactive toy that your horse will love. The refills are made from a unique recipe, using extremely high temperatures during the production process, to create a solid centre that the horse can only lick or scrape. When used in conjunction with the toy, it also spins making it even more challenging and entertaining. Comes with original refill. Likits are very popular & come in a range of delicious flavours & pack sizes. They are designed to be used in conjunction with Likit toys: the Likit Holder or the Boredom Breaker. Little Likits are designed to be used in conjunction with Likit toys: the Boredom Buster, the Boredom Breaker or the Tongue Twister. These popular licks come in a variety of yummy flavours & pack sizes. 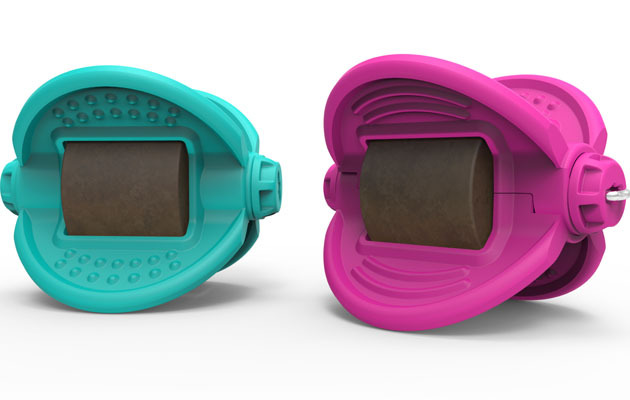 Likit Holders are the easiest, most affordable way to entertain your horse with Likits. This fun toy can be hung up in the stable with the rope provided, giving hours of amusement to your horse. Likit Boredom Breakers are a combination toy, with a Likit Holder on the top (that takes a 650g Likit) & a sturdy ball attached to the lower part, with space for two Little Likits. This fun toy can be hung up in the stable with the rope provided. The Likit Boredom Buster is a challenging toy that spins around on its horizontal axis. It takes two Little Likits (sold separately). It can be used by itself, or attached onto the "Likit Holder", to make a combination toy. Likit Starter Kits are fantastic value, with each kit containing a Likit Holder; one each of Apple, Carrot & Cherry Likits 650g; one pack of Mint & Eucalyptus Snaks 100g & one pack of Apple & Cinnamon Snaks 100g. Likit Tongue Twisters can be fixed to your horses stable wall, field fence or horsebox. The ball takes two Little Likits & when licked, spins on its horizontal axis, providing hours of entertainment. Scientifically proven to reduce cribbing by 27%.